Russian-Hebrew poet and author; born at Starokonstantinov, Volhynia,Jan. 14, 1811; died at Byelostok April 12, 1899. His father was a cantor who sympathized with the progressive movement, and young Gottlober was educated in that spirit to the extent of receiving instruction in Biblical and modern Hebrew as an addition to the usual Talmudical studies. At the age of fourteen he married the daughter of a wealthy "Ḥasid" in Chernigov, and settled there. When his inclination for secular knowledge became known, his father-in-law, on the advice of a Ḥasidic rabbi, caused the young couple to be divorced, and Gottlober, who had joined the Ḥasidim after his marriage, now became their bitter enemy. He married again, but found his second wife unbearable and soon divorced her. In 1830 he married for the third time and settled in Kremenetz, where he formed a lasting acquaintance with Isaac Bär Lewinsohn. Gottlober traveled and taught from 1836 to 1851, when he went to Jitomir and passed the teachers' examinations at the rabbinical school. After teaching for three years at a government school for Jewish boys in Kamenetz-Podolsk, he was transferred to a similar position in his native city, where he remained for about eleven years. In 1865 he became a teacher in the rabbinical school in Jitomir, and remained there until it was closed by the government in 1873. He then settled in Dubno with his son-in-law, Bornstein, who was the official rabbi of that town. Thence he removed to Kovno, and subsequently to Byelostok, where the aged poet, who in later years had become blind, ended his days in poverty and neglect. Gottlober was a prolific writer and one of the foremost of Neo-Hebrew poets. The first collection of his poems, which was entitled "Pirḥe ha-Abib," appeared in Yozefov in 1836. A second collection, entitled "Ha-Niẓanim" (Wilna, 1850), was followed by "'Anaf 'Eẓ Abot," three poems, on the death of Emperor Nicholas I., on the peace of 1856, and on the coronation of Alexander II., respectively (ib. 1858). 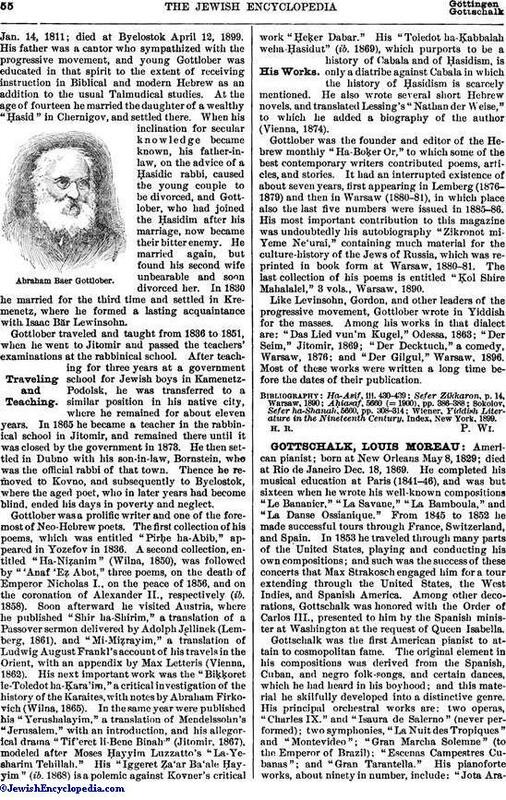 Soon afterward he visited Austria, where he published "Shir ha-Shirim," a translation of a Passover sermon delivered by Adolph Jellinek (Lemberg, 1861), and "Mi-Miẓrayim," a translation of Ludwig August Frankl's account of his travels in the Orient, with an appendix by Max Letteris (Vienna, 1862). His next important work was the "Biḳḳoret le-Toledot ha-Ḳara'im," a critical investigation of the history of the Karaites, with notes by Abraham Firkovich (Wilna, 1865). In the same year were published his "Yerushalayim," a translation of Mendelssohn's "Jerusalem," with an introduction, and his allegorical drama "Tif'eret li-Bene Binah" (Jitomir, 1867), modeled after Moses Ḥayyim Luzzatto's "La-Ye-sharim Tehillah." His "Iggeret Ẓa'ar Ba'ale Ḥayyim" (ib. 1868) is a polemic against Kovner's critical work "Ḥeḳer Dabar." His "Toledot ha-Ḳabbalah weha-Ḥasidut" (ib. 1869), which purports to be a history of Cabala and of Ḥasidism, is only a diatribe against Cabala in which the history of Ḥasidism is scarcely mentioned. He also wrote several short Hebrew novels, and translated Lessing's "Nathan der Weise," to which he added a biography of the author (Vienna, 1874). Gottlober was the founder and editor of the Hebrew monthly "Ha-Boḳer Or," to which some of the best contemporary writers contributed poems, articles, and stories. It had an interrupted existence of about seven years, first appearing in Lemberg (1876-1879) and then in Warsaw (1880-81), in which place also the last five numbers were issued in 1885-86. His most important contribution to this magazine was undoubtedly his autobiography "Zikronot mi-Yeme Ne'urai," containing much material for the culture-history of the Jews of Russia, which was reprinted in book form at Warsaw, 1880-81. The last collection of his poems is entitled "Ḳol Shire Mahalalel," 3 vols., Warsaw, 1890. Like Levinsohn, Gordon, and other leaders of the progressive movement, Gottlober wrote in Yiddish for the masses. Among his works in that dialect are: "Das Lied vun'm Kugel," Odessa, 1863; "Der Seim," Jitomir, 1869; "Der Decktuch," a comedy, Warsaw, 1876; and "Der Gilgul," Warsaw, 1896. Most of these works were written a long time before the dates of their publication. 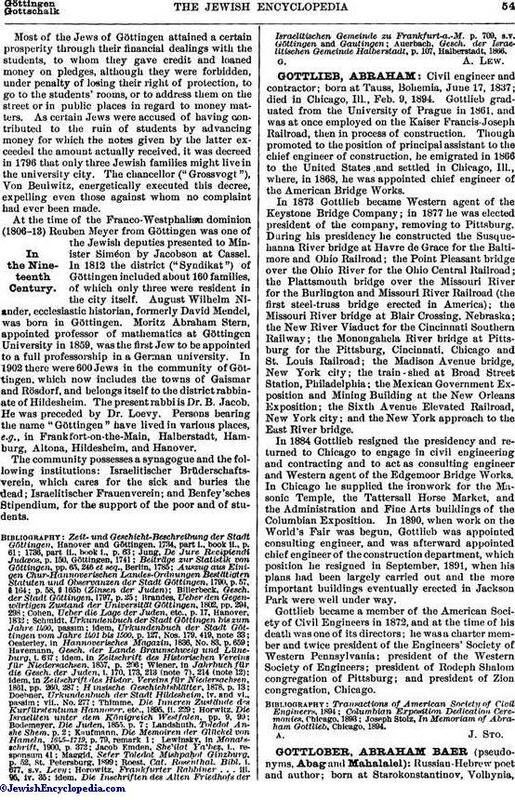 Wiener, Yiddish Literature in the Nineteenth Century, index, New York. 1899.